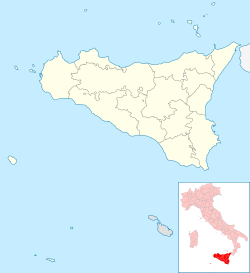 Termini Imerese (Italian pronunciation: [ˈtɛrmini imeˈreːze; -eːse]; Sicilian: Tèrmini [ˈtɛɾmɪnɪ])[a] is a town and comune in the Metropolitan City of Palermo on the northern coast of Sicily, southern Italy. The site of the town has been populated since prehistoric times, as many archaeologial excavations have shown through the years. Its documented history begins in 409 BC after the second Battle of Himera when its more ancient neighbour, Himera (now completely within the comune's borders), was completely destroyed by the Carthaginian army under Hannibal Mago. Those who survived the devastation moved to a site then called "Thermae" which is today known as Termini and became the successor to Himera. The new town of Thermae or Therma, called for the sake of distinction Thermae Himerenses, obviously derived its name from the hot springs for which it was celebrated, and the first discovery of which was connected by legends with the wanderings of Hercules. It appears to have quickly become a considerable town, though it continued to be subject to Carthaginian rule. In the First Punic War its name is repeatedly mentioned. In 260 BC, a body of Roman troops were encamped in the neighbourhood when they were attacked by Hamilcar and defeated with heavy loss. Before the close of the First Punic War (241 BC), Thermae was besieged and taken by the Romans but the city seems to have been treated with unusual favour by its conquerors. Cicero tells us that the Romans allowed the Thermitani to govern their city and territory with their own laws as a reward for their steady fidelity. As they were on hostile terms with Rome during the First Punic War, it can only be to the subsequent period that this "fidelity" applies. In the time of Cicero (80-40 BC), Thermae appears to have been a flourishing place, carrying on a considerable amount of trade, though he speaks of it as oppidum non maximum. He attested the magnificence of the ancient city and the taste of its citizens for the encouragement of art, calling it in primis Siciliae clarum et ornatum as statues were preserved by the Thermitani to whom they had been restored by Scipio after the conquest of Carthage. It seems to have become a colony in the time of Augustus (27 BC - 14 AD), whence we find mention in inscriptions of the Ordo et Populus splendidissimae Coloniae Augustae Himeraeorum Thermitanorum. Thermae colonia is mentioned by Pliny and must refer to this town, though he seems to confuse it with Thermae Selinuntiae (modern Sciacca) on the south coast which was not a colony. There are few subsequent accounts of Thermae; but, as its name is found in Ptolemy and the Itineraries, and from the impressive aqueduct and some other remains it appears to have continued in existence throughout the period of the Roman Empire, and probably never ceased to be inhabited, as the modern town of Termini Imerese retains the ancient site as well as name. Following the fall of the Roman Empire, the city entered a period of decline. Termini continued to exist as a bishopric until the 12th century, though the list of bishops contains various gaps and uncertainties. Under Norman rule, the city was at first a royal city; it subsequently became one of 42 città demaniali, cities administered directly by the crown rather than local nobility. Above all, from the Middle Ages through the beginning of the 19th century, Termini served as a major center for the collection and shipping of grain and other foodstuffs stored and subjected to duty in a special government warehouse complex (the caricatore regio). The presence of the caricatore improved the fortunes of the city, turning it into one of the major ports of Sicily and strengthening its commercial relationships with the maritime republics of Genoa, Pisa and Venice as well as the major Mediterranean ports (Marseille, Barcelona, etc.) and, during the 16th century, those of the Atlantic. Towards the end of the 18th century, Termini became the site of the Ereina Imerese branch of the Ereina di Palermo academy, followed soon thereafter by the establishment of the Accademia Euracea, later the Accademia Mediterranea Euracea. In the 19th century, however, the closing of the caricatore precipitated a profound economic crisis that lasted until the end of the 20th century, when artisanal and proto-industrial activity began to replace the traditional agricultural base of the city's economy. A period of population decline, linked primarily to emigration to the Americas, was balanced at the beginning of the 20th century by immigration from Agrigento, Messina and Ragusa. Between 1970 and 2011, Termini was home to a large Fiat automobile manufacturing facility, where small cars such as the 126, the original Panda, and the Punto have been manufactured. The plant was the sole assembly site for the second generation Lancia Ypsilon built between 2005 and 2011. In 2006 the plant celebrated its four millionth car produced. At the end of 2011, Fiat sold the plant to Chinese car manufacturer Chery. Since 1 January 2015, has been owned by Blutec. There is also a power station operated by Enel with a generation capacity of 454 MW. Cathedral of St. Nicholas of Bari (1604). It houses a statue by Giorgio da Milano (1487) and several works by Ignazio Marabitti. Church of St. Catherine of Alexandria (1th-16th centuries). It is home to a series of frescoes depicting the life of the namesake saint. ^ Ancient Greek: Θέρμαι Thérmai, Ancient Greek: Θερμαὶ αἱ Ἱμερᾶαι Thermaì hai Himerâai (Pol. ), Ancient Greek: Θερμαὶ Ἱμέραι Thermaì Himérai (Ptol. ), or Ancient Greek: Θερμὰ (Ἱμεραῖα) Thermà (Himeraîa) (Diod. ); Latin: Thermae Himerenses; literally "Himera's hot springs". ^ Diod. iv. 23, v. 3; Pind. Ol. xii. 28. ^ Pol. i. 24; Diod. xxiii. 9. Exc. H. p. 503. ^ Pol. i. 39; Diod. xxiii. 20. Exc. H. p. 506. ^ Id. ii. 46, 75, iii. 42. ^ Castell. Inscr. Sicil. p. 47; Gruter. Inscr. p. 433, no. 6. ^ Plin. iii. 8. s. 14. Wikimedia Commons has media related to Termini Imerese. "Termini Imerese" . Encyclopædia Britannica (11th ed.). 1911. This page was last edited on 3 April 2019, at 18:40 (UTC).